Participate in the following 3 educational activities and earn 0.5 AMA PRA Category 1 Credits™ for each activity. Explore scientific journal abstracts or articles from most orthopaedic journals and rate the article's impact on your clinical practice with our 4 Article Impact Polls. Step 1: Search for Journal Articles. Step 2: Click the "Vote" button. Step 3: Read the Abstract or Article PDF (if available). Step 4: Rate the article with our 4 Article Impact Polls. 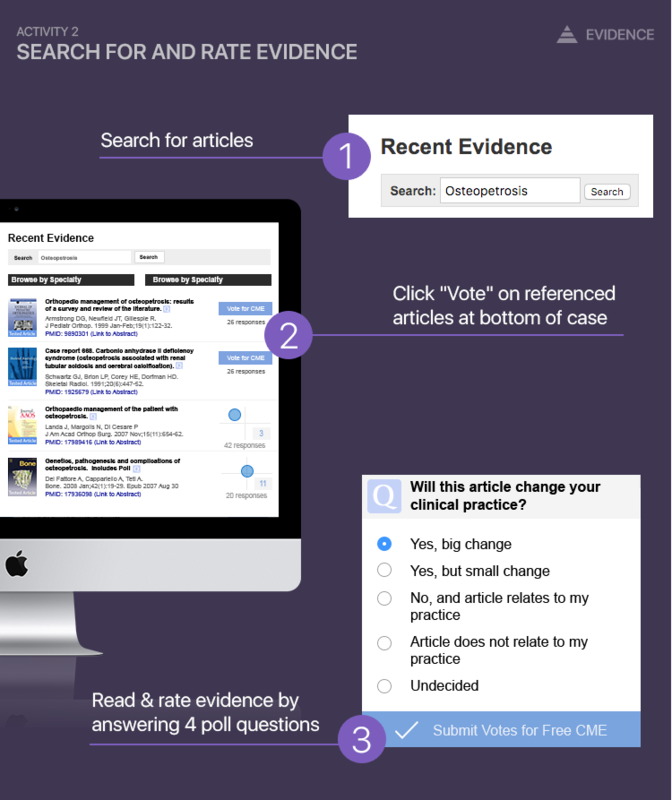 Explore thousands of clinical cases posted by our physician members, vote on treatment polls and add journal articles to support your clinical choices. 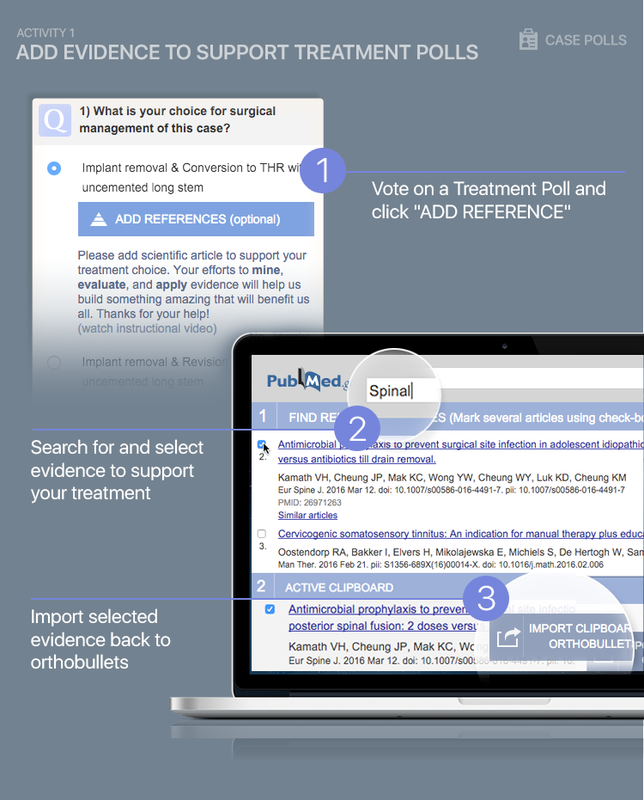 Simply post a comment sharing your experience and opinions on different Case Studies, Journal Articles, Videos, or any other content on orthobullets. Just make sure to support your opinion with a journal article reference. Step 1: Go to the comment section under the related content. Step 2: Write a comment sharing your experiences. Step 3: Click "Add Article Reference" to add a supporting reference. Step 4: Search Pubmed, check the box to the left of the desired article, and click "Import Clipboard". 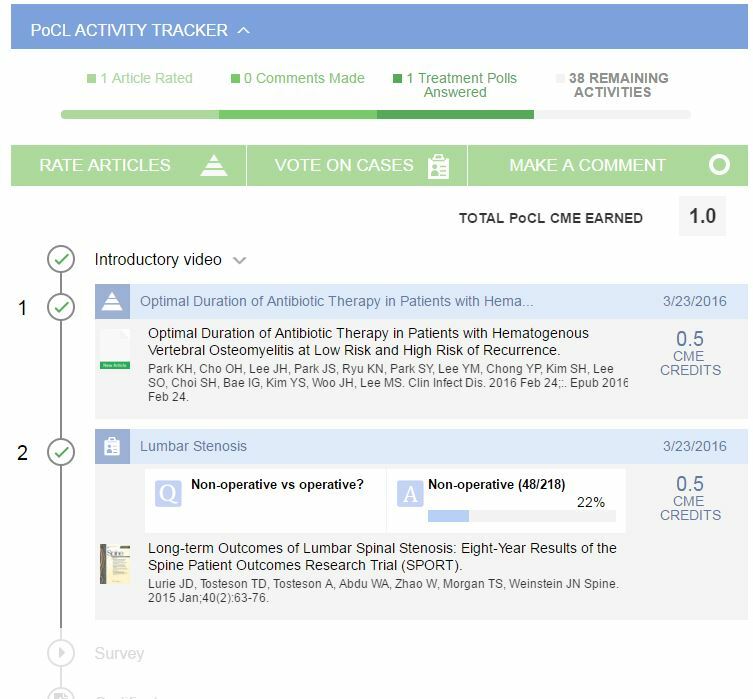 Use the PoCL Activity Tracker to monitor your progress until you reach 20 Credits (40 total activities) and download your CME certificate. 1. Credits from 2019 cannot be transferred into 2020. Therefore, complete your activities and download your certificate before 12:00 AM PST on December 31, 2019. 2. You cannot earn partial CME Credit. For example, you cannot complete only 10 activities and get 5 CME credits. You must complete all 40 activities and download the certificate for 20 CME credits. In 2005 the American Medical Association (AMA) Council of Medical Education approved a format of computer-based medical education entitled Internet Point-of-Care (PoC) learning. This new learning format provides medical providers with the opportunity to earn AMA PRA Category I Credit™ for consulting the medical literature online and applying their learning to their clinical practice. 1) Search for and evaluate 40 scientifc articles related to patient care within the 2019 calendar year. 2) Understand the scientific methodology and implications on treatment guidelines of each study. 3) Complete the polls rating the impact of the study on ones practice. 4) Complete a post CME activity survey. 1) Identify findings in up-to-date studies that influence current practices. 2) Analyze new studies that impact physician practice. 3) Apply current literature to physician’s best practice. COURSE DEADLINE: You must complete all course activity and obtain certificate before midnight on December 31, 2019. Partial credit cannot be given. Therefore physicians must read a total of 40 articles for 20 credits. This activity is targeted to physicans whose scope of practice includes orthopaedic surgery and related fields. This activity has been planned and implemented in accordance with the Accreditation requirements and policies of the Accreditation Council for Continuing Medical Education (ACCME) through the joint providership of the Foundation for Orthopaedic Research and Education (FORE) and Lineage Medical, LLC. FORE is accredited by the ACCME to provide continuing medical education for physicians. 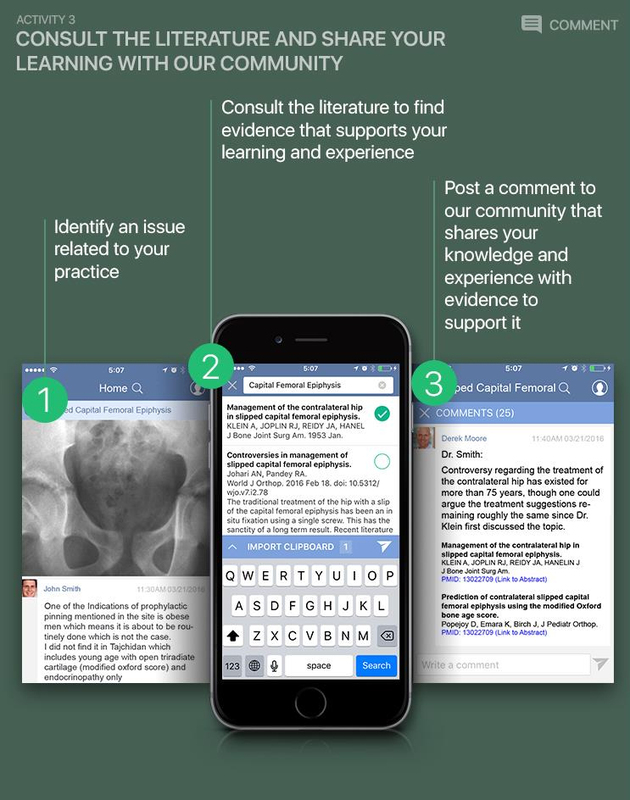 Foundation for Orthopaedic Research and Education designates this internet Point of Care activity for a maximum of 20 AMA PRA Category 1 Credits™. Physicians should claim only credit commensurate with the extent of their participation in the activity. This activity has been planned and implemented in accordance with the Accreditation requirements and policies of the Accreditation Council for Continuing Medical Education (ACCME) through the joint providershipof the Foundation for Orthopaedic Research and Education (FORE) and Lineage Medical, LLC. FORE is accredited by the ACCME to provide continuing medical education for physicians. Users must have access to a computer, internet browswer (Internet Explorer, Google Chrome, Safari, Firefox), and WIFI to participate in this activity. Comments with evidence may also be posted on iOS and Android Bullets* App that can be downloaded HERE. FORE (accredited CME provider) endorses the standards of the ACCME that requires everyone in a position to control the content of a CME activity to disclose all financial relationships with commercial interests that are related to the content of the CME activity. CME activities must be balanced, independent of commercial bias, and promote improvements or quality in healthcare. All recommendations involving clinical medicine must be based on evidence accepted within the medical profession. A conflict of interest is created when individuals in a position to control the content of CME have a relevant financial relationship with a commercial interest which therefore may bias his/her opinion and teaching. This may include receiving a salary, royalty, intellectual property rights, consulting fee, honoraria, stocks or other financial benefits. FORE has identified, reviewed and resolved all conflicts of interest that speakers, authors, or planners disclose prior to an educational activity being delivered to learners. Disclosure of a relationship in not intended to suggest or condone bias in any presentation. Rather, disclosure is required so participants can make a fair and comprehensive evaluation of a presentation. 1) Search for and evaluate 40 scientifc articles related to patient care within the 2018 calendar year. COURSE DEADLINE: You must complete all course activity and obtain certificate before midnight on December 31, 2018. Partial credit cannot be given. Therefore physicians must read a total of 40 articles for 20 credits.